Years of bad jokes have convinced many people that root canals are painful and to be avoided at all costs. Unfortunately, that false belief spurs some people to avoid visiting the dentist when they notice signs of trouble. Roseville, CA, dentist Drs. Ibtisam Rashid and Hana Rashid often treat patients who've experienced a few common signs that may occur if a root canal is needed. It's easy to overlook early signs of trouble in a tooth. 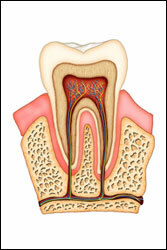 Problems occur when the soft pulp in the core of a tooth becomes inflamed or infected. Eventually, an inflammation or infection can cause a variety of symptoms, some which may seem minor at first. Mild pain can occur, but it may seem to go and come, leading many people to hope that it will eventually stop without treatment. The gum around the tooth can appear red or swollen, but that can be explained away as a temporary inconvenience or the effects of brushing too hard. Either of these signs may indicate that you can benefit from a root canal, a procedure that involves removing the pulp, cleaning the inside of the tooth and the root canals, shaping the canals and filling your tooth with rubber-based material. Although your pulp will be gone after the procedure, your tooth will continue to function normally. Some root canal signs and symptoms are more difficult to ignore. Has your tooth changed color? Darkening of a tooth is never a good sign and warrants a trip to your Roseville dentist's office. As the inflammation or infection worsens, pain may be more intense or may occur more frequently. You may also notice that pain intensifies after you eat, particularly if you eat or drink hot or cold foods and beverages. In fact, your tooth may feel very uncomfortable for about 30 minutes after you've eaten. Ignoring potential danger signs can put your health at risk. Fever, severe pain, pus around your tooth, a pimple on your gum, swollen lymph nodes and facial swelling are signs of an abscess. The condition is caused by a bacterial infection. Once the antibiotics begin to work, the next step is a root canal to remove the infected pulp. Root canals protect your teeth and your health! Call Roseville, CA, dentist Drs. Ibtisam Rashid and Hana Rashid at (916) 780-1955 to schedule your appointment.